not enough fanfare for Calvin & Hobbes nowadays, you cant even ask people about it cuz even they dont know. man I really hope that second part isn't true. if so, tears will start to stream down my cheeks. well i guess time to work on some calvin and hobbes fan art! That's a nice pic of Hobbes. 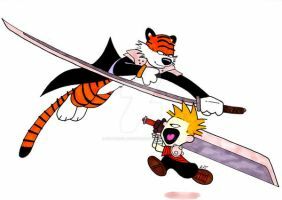 I'm a huge Calvin and Hobbes fan. this is still my favorite one...though maybe it's because I'm biased. Looks great man. Good coloring. thanks micah, you a fan? yeah, i love hobbes. i really appreciate how the artist didn't allow the cartoon to be commercialized. although the bumpersticker of Calvin peeing seems to be quite popular.